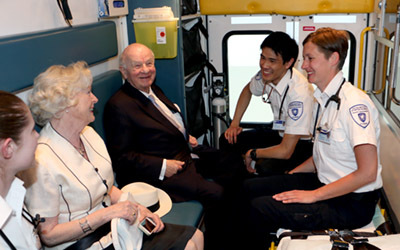 Andrew Saxton, LLD (third from left) and his wife Sophie (second from left) with JIBC paramedic students in the back of the JIBC training ambulance he supported. Lights flashing, sirens blaring, bystanders watching. In the midst of this chaos, paramedics calmly survey the situation, stabilize the patient, and load them into the ambulance for transport to hospital. This is just one of the scenes played out regularly in training scenarios at the Justice Institute of British Columbia (JIBC) Paramedic Academy. Thanks to the generous support of Vancouver business leader, philanthropist and JIBC honorary degree recipient Andrew Saxton, LLD, JIBC students in the Emergency Medical Responder (EMR), Primary Care Paramedic (PCP), and Advanced Care Paramedic (ACP) programs will be spending more time learning and mastering life-saving medical skills in the safe, controlled environment of a modern training ambulance. 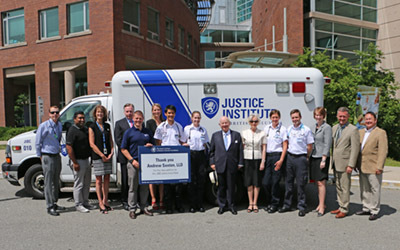 Andrew Saxton, LLD (ninth from left) and his wife Sophie with JIBC paramedic students, faculty and staff, Dr. Michel Tarko, JIBC President and CEO (second from right); Barb Kidd, Dean of the School of Health, Community and Social Justice (third from left), Kathy Harms, Director of the Health Sciences Division (sixth from left), Tracy Campbell, Executive Director, JIBC Foundation and Associate Director, Office of Development (third from right); and members of The JIBC Foundation board Daniel Whittle (fourth from left) and Rick Page (first on the right). The newer, more-equipped model, made possible by Andrew’s contribution, expands the fleet and extends the useful life of JIBC’s training vehicles, which are deployed around the province in support of training in communities served by JIBC. As the JIBC Paramedic Academy trains over 1,000 EMR students, and approximately 200 in paramedicine annually, equipment can experience frequent use. Andrew and his wife, Sophie, were on hand at the New Westminster Campus on June 7, 2016 to welcome the new addition and get a taste of what it’s like to be a paramedic in training. The Saxton’s had the opportunity to get a rare glimpse of training from the back of the ambulance in a ride along with PCP students with sirens on and lights flashing. The JIBC applied learning model strives for authenticity. Every piece of equipment in the JIBC ambulance, right down to supplies like bandages, are in the same place as you would find them in a regular BC ambulance. What sets this training ambulance apart is the special audio-visual equipment embedded in the ambulance to capture important training moments for review and playback later. For Andrew, philanthropy is deeply rooted in his character. From his early start in Canada as an orphan from Hungary in 1947, he has established a number of significant enterprises that have all created major employment opportunities, served on the boards of several prominent businesses, and made considerable contributions to health, education and charitable organizations in Canada.